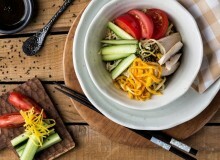 This article is adapted from Anna Jassem and Aleksander Szojer’s upcoming book, In the Rhythm of the Seasons: Japanese Customs and Home Recipes. 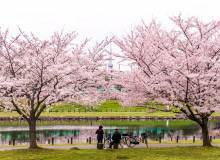 Starting in early spring, all major Japanese media provide daily updates on the sakura (cherry blossom) front, which moves up from the subtropical Okinawa to northernmost Hokkaido. 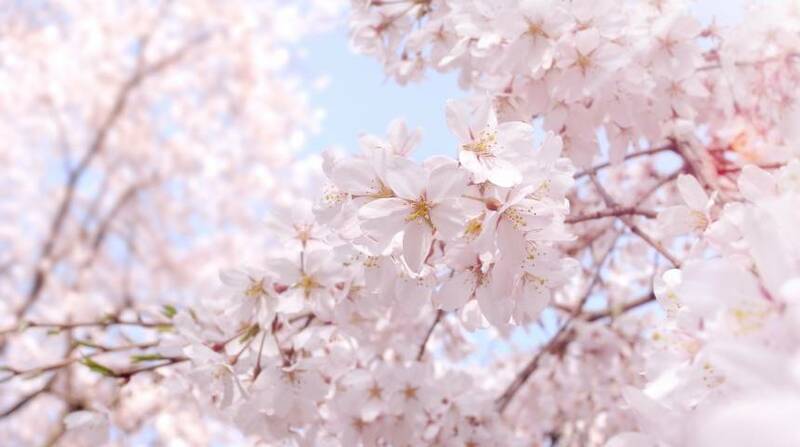 Well before the first buds appear on trees, the color pink pops up all over the supermarket shelves, with half of the products being sold in sakura packaging or even in sakura flavor (which, counterintuitively, is actually the flavor of the cherry petals rather than the fruits). Once the Japan Meteorological Agency officially announces the arrival of spring in a given area, the annual craze of hanami (literally “flower viewing”) begins. Young mothers with their little ones, seniors with their watercolors, amateur photographers with suitcases full of professional equipment and crowds of office workers flock to parks for picnics and parties under the blossoming trees. “Earlier, companies would send their most junior members to hold the spot since early morning or even the night before,” recalls Miyuki Suyari from the Simply Oishii Cooking School in Tokyo. “Nowadays, it will usually suffice to leave a note on the ground with the date and time of a hanami gathering for other groups to respect it.” Upon arrival, everyone takes off their shoes and cuddles up on one of the big blue tarps that are normally used to protect construction sites. “The plastic sheets are used in place of portable tatami mats as they are light, sturdy and cheap,” explains Miyuki. Once everyone is settled, the eating and drinking can finally begin. The Japanese joke that “dango [sweet rice balls] are more important than the flowers themselves”—hana yori dango. Beyond the typical bento items, such as karaage (deep fried chicken), onigiri (rice balls with various fillings) and vegetable side-dishes, hanami bento should also feature some pink elements. “We try to make hanami bento as colorful as possible and pink is an absolute must,” explains Miyuki. Try sprinkling rice with sakura denbu (pink-colored fish flakes) or mixing it with salted cherry blossoms to make pink onigiri balls. 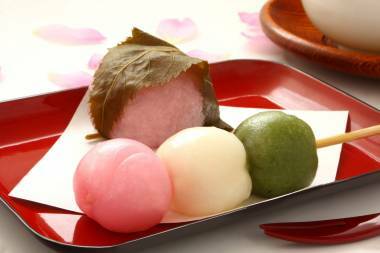 And be sure to taste some of the pink seasonal sweets too, such as hanami dango (pink, white, and green rice balls, symbolizing respectively spring, winter and summer) and sakura mochi (pink rice cakes, filled with sweet red bean paste and wrapped in pickled salty-sour cherry leaves). Needless to say, all these delicacies should be washed down with huge quantities of beer and sake. But don’t overindulge—during last year’s hanami season, some 100 people in Tokyo alone ended up in hospitals due to alcohol poisoning. (literally “pathos of things”)—the bittersweet taste of passing—is the key concept of Japanese aesthetics and the ephemerid cherry blossoms are the perfect embodiment of the concept. It’s by no coincidence that cherry blossom became a symbol of Japanese samurai, who (just like the cherry petals) would often end their life at the moment of the greatest blossom. Karaage, Japanese style deep-fried chicken, is one of the most popular Japanese snacks and the perfect accompaniment to a cold beer. It tastes great both hot or cold, which makes it an ideal bento item. This recipe is particularly quick and easy to prepare as it uses chicken breast, but depending on your preference, you can also use thigh meat. Once you master the basic principle, have fun adjusting the seasoning to your liking. Cut the chicken breast fillet into large bite-sized pieces. Place the chicken pieces in a bowl and add all the ingredients for the marinade. Stir well and rub the marinade into the chicken using your hand, then leave to marinate for 20 minutes. Add 50g of the potato starch and rub well, then add the remaining potato starch and rub until the chicken pieces are evenly coated. Heat the oil in a pan to around 160-170℃. Deep-fry the chicken pieces until they are cooked through and the color becomes lightly brown. Made from soybeans, rich in protein and low in calories, tofu is a very nutritious and healthy ingredient. This delicious tofu karaage–crispy on the outside and soft on the inside–will appeal also to those less enthusiastic about tofu’s subtle flavour. In fact, you can hardly notice it’s not chicken! c. Wrap in a paper towel and microwave for 6 minutes. Tear the tofu into bite sized pieces. Squeeze out the water. Mix soy sauce, sake, grated garlic and grated ginger in a bowl. Add the tofu and marinate for 20 minutes. Gently squeeze the liquid and dust with a mixture of flour and potato starch. Pour 1 cm oil into a skillet and place over high heat. Once the oil starts to bubble, add the tofu and fry on both sides until golden brown. A hint: The secret of this recipe lies in freezing tofu before frying, which changes its texture to be more spongy and meat-like. 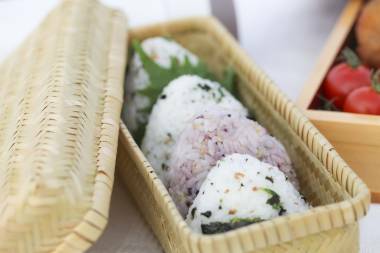 Onigiri—rice ball with different ingredients, usually wrapped in a nori seaweed sheet—is the Japanese equivalent of a sandwich and a popular snack or picnic item. 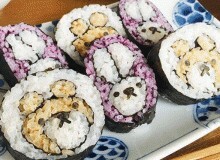 Although you can buy onigiri in any grocery shop in Japan, those handmade with love are still the most valued. As for the filling, the ingredients given below are just one of the many possibilities. Don’t be afraid to experiment with other ingredients, such as small pieces of grilled salmon, pickled vegetables or bonito flakes mixed with soy sauce. Wash the rice in a bowl. Repeat the washing and draining 5 times, then transfer to a sieve to drain. Transfer the washed rice, water and salt into the inner bowl of a rice cooker. Give it a stir and cook according to your cooker’s instructions. If you’re using a pot, let the washed rice soak with water for 30 minutes. Cover and bring to a boil over high heat. When it reaches boiling point, lower the heat and simmer for another 10-12 minutes. Turn off the heat and leave it to steam for 15 minutes. Add the tuna, ginger and chive, and mix well. Let the rice cool slightly. Divide the rice, each portion weighing 100g. Form it into a flattened ball shape using both your palms, pressing gently and lightly. For a triangular shape, straighten your left hand (it will be the base of your triangle) and bend the fingers of your right hand so as to form the other two sides of the triangle. Rotate the rice a few times in your hands until achieving the desired shape. Wrap each rice ball with a sheet of nori seaweed. Key: Use sushi rice or Japanese short grain rice, as they are sticky and stay moist even when cooled down, so the onigiri keeps its shape and remains tasty. Tamagoyaki (rolled omelette) is a traditional Japanese dish and a popular choice for bento boxes as well as a side dish for everyday family meals. The Japanese fry tamagoyaki in a few layers on a special rectangular pan; however, the technique is quite tricky. This recipe uses an easy method and the result is just as delicious—slightly sweet and savory at the same time. Place a sheet of foil on a bamboo sushi mat. Crack the eggs into a bowl, then add the sugar and soy sauce. Beat well with a whisk. Heat the oil in a frying-pan over a high heat, and pour the eggs swiftly. Using a wooden fork or spatula, lightly mix the eggs and gather to make a rectangular shape. Make sure the eggs are coagulated but still soft. Place the omelette on the foiled mat and roll it tightly (making sure not to leave the foil between the omelette layers). Leave it until cooled down, then put it in the fridge to set. Once set, cut the omelette into large bite sized pieces. A hint: A bamboo sushi mat (makisu) is a Japanese cooking tool, commonly used to make sushi rolls. It’s made of woven bamboo with cotton string. You can find one at a world food section in a large supermarket or at an oriental grocery. If you don’t have the mat, put some aluminum foil on top of a tea towel. A super-fast yet delicious salad of blanched asparagus and rich sesame dressing that will bring spring to your table. Simplicity at its best! Wash the asparagus and remove the bottom hard part. Cut into 3-cm pieces. Blanch the asparagus in boiling water until just tender. Put in cold water to preserve the color and drain. Add the sauce to the asparagus and mix until the asparagus is covered evenly.